Houghton Mifflin Harcourt, 9780547003092, 384pp. Julie Zickefoose lives for the moment when a wild, free living bird that she has raised or rehabilitated comes back to visit her; their eyes meet and they share a spark of understanding. Her reward for the grueling work of rescuing birds—such as feeding baby hummingbirds every twenty minutes all day long—is her empathy with them and the satisfaction of knowing the world is a birdier and more beautiful place. The Bluebird Effect is about the change that's set in motion by one single act, such as saving an injured bluebird—or a hummingbird, swift, or phoebe. Each of the twenty five chapters covers a different species, and many depict an individual bird, each with its own personality, habits, and quirks. And each chapter is illustrated with Zickefoose's stunning watercolor paintings and drawings. 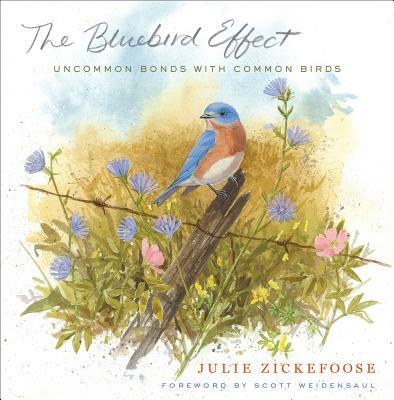 Not just individual tales about the trials and triumphs of raising birds, The Bluebird Effect mixes humor, natural history, and memoir to give readers an intimate story of a life lived among wild birds. Writer/artist JULIE ZICKEFOOSE is fascinated by the interface of birds and people. She is the author of Natural Gardening for Birds; Letters from Eden: A Year at Home, in the Woods; The Bluebird Effect: Uncommon Bonds With Common Birds; and Baby Birds: An Artist Looks Into the Nest. She is the only person ever to specialize in painting the day-to-day development of nestling birds. Studying blue jays, a familiar yet deeply mysterious species, has opened a new world to her. She lives and documents the lives of birds, bobcats, coyotes, deer, and other wildlife on an 80-acre sanctuary in southeast Ohio.